Keeping your air conditioner clean is essential to your air conditioners “health” of sorts. 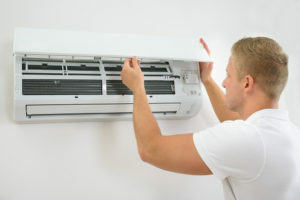 Cleaning your air conditioner removes dust and other harmful materials that could affect the productivity and mechanics of the air conditioner and helps to reduce the risk of your air conditioner encountering a problem and needing repair. Continue reading to learn more about a few ways you can keep your air conditioner in tip-top shape. Are you experiencing difficulty with your air conditioner? Let AirZone Solutions know how we can help you. AirZone Solutions is an experienced air condition repair company that specializes in residential and commercial air conditioning service, repair, maintenance, installation and replacement. Contact us today at 561-247-4328. Carefully vacuum the fins of the indoor air conditioner with a soft brush to avoid bending or crushing soft materials. Vacuum the blower compartment and change the filter whenever it becomes dirty. If you need to purchase a new filter, make sure that you take your old filter with you to the store to make sure that you purchase the right size filter. Before cleaning, turn the power to the furnace or blower off. There is usually a toggle switch in a metal box nearby, or you may have to turn the power off at the main panel. Make sure that you keep the power to the blower off whenever you remove the filter, or you will be blowing dust into the evaporator fins. Consult your user’s manual to find the oil ports on the blower, if there are any. The blower compartments on newer furnaces and heat pumps are extremely tight and the blower is difficult to lubricate without removing it. If this is the case with your blower, enlist the help of an experienced air conditioner repair man. The evaporator fins dehumidify the air as they cool it, and you should be able to find a tube to drain the condensation. The water collects in a pan and drains out the side, and most tubes are easy to remove and clean. However, if the tube is rigid plastic, you may have to unscrew or cut off the tube with a saw; after cleaning the tube, you can glue it back in place using a coupling, or replace them with flexible plastic tubes. AirZone Solutions serves residents of Boca Raton, Delray Beach, Palm Beach, and West Palm Beach and offers a variety of air condition repair services. At AirZone Solutions, we value our customers and place excellent customer service at the top of our priority list. For a FREE estimate and consultation, call 561-AIR-HEAT (561-247-4328) or visit airzonefl.com. According to bls.gov, the job outlook from 2010-2020 of heating, air conditioning, and refrigeration mechanics and installers is 34%, which is much faster than average.